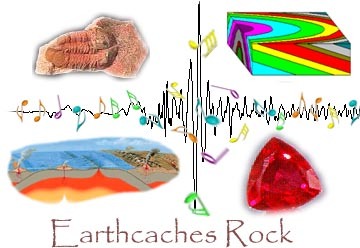 Ice Ages have affected the planet numerous times over the past 2.5 million years. During these periods of cooler temperatures, water from the oceans accumulates on the land as glaciers reducing the volume of water in the oceans lowering sea levels. Then temperatures rise again (an interglacial period), melting the land locked ice and ocean levels rise again. During one of the more recent glacial periods, about 20,000 years ago, the ocean receded to a shoreline out near the Farallon Islands about 27 miles to the west. At that time, the San Francisco Bay was a broad open valley teeming with the megafauna of the Pleistocene. Through this valley, the river we now call the Sacramento River flowed out through the Golden Gate Headlands and across the coastal plain to empty into the ocean somewhere near the Farallon Islands. 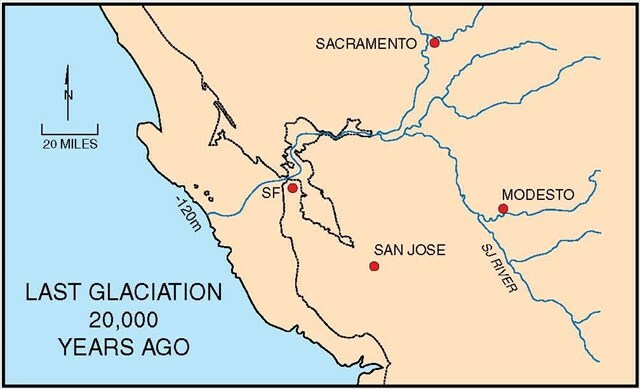 The Ancient Sacramento River likely was the drainage for 40% of California and thus had a high flow. 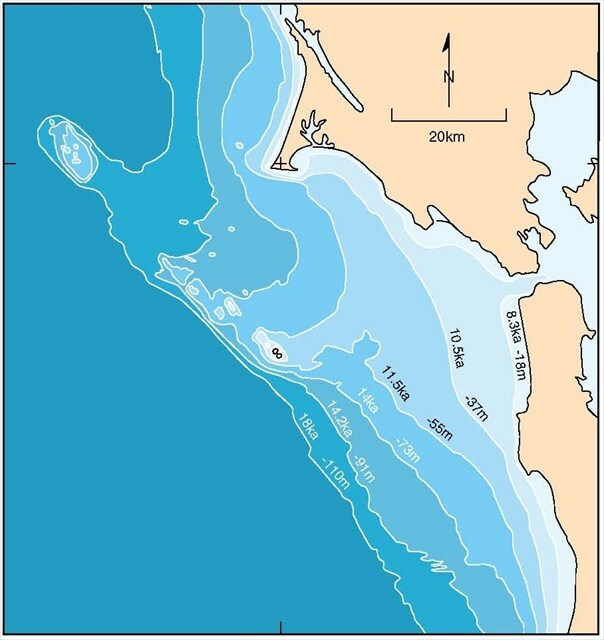 Estimates based on how deep the bedrock is below the bay suggest that the river bed dropped over 200 feet between Angel Island and the Golden Gate (about 2 miles) creating a series of cascades. The sediments that the Sacramento River transported out on the coastal plain were blown back landward forming huge dune fields (See The Sands of Time ). One of those dune fields has now been submerged and is called the Potato Patch Shoals. By about 18,000 years ago, temperatures had been increasing, melting the continental ice sheets and ocean levels were rising again. The melting ice from the glaciers in the Sierra Nevada Mountains would have added to the flow of the Sacramento River helping erode the channel through the Golden Gate. By about 8,000 years ago the rising sea levels drowned the river channel, turning the gap into the Golden Gate Strait and began filling the San Francisco Bay. Today the Golden Gate Strait remains open due to the swift tidal currents that flow through it. The figure below shows an interpretation of where the coastline was at various times between 18,000 years ago (18ka on the map) and present day. The question that has not really been resolved is why did the river cut through the headlands at this spot? Highly resistant rocks are present on both sides of the headlands and ranges of hills extend north and south for many miles. There are two theories: one theory is that the ancient Sacramento River course predated the mountains and eroded through the mountains as they grew. The headlands are actually relatively young and the erosive power of the river with the added flow from melting glaciers could have maintained its course through the growing mountains. The other theory is that there is an unidentified fault that runs through the strait. The bedding planes of the rocks on either side of the strait are different suggesting a fault.Neither theory has enough evidence to be fully accepted because the evidence lies under the water. What is the velocity of the tidal flow that goes through the straight and what river is it compared to? How much lower was the sea level during the last Ice Age according to the information sign? Based on the image on the information sign how much of the bay would be above sea level?